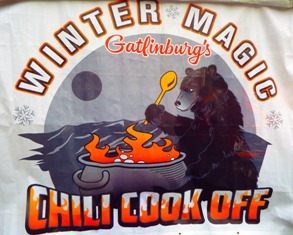 The annual Gatlinburg Chili Cook-off is just one of the exciting ways to experience the Winter Magic of Gatlinburg! Area vendors come together to compete using their own recipes. Only one booth will win the "coveted" People's Choice Award, and it's up to YOU to decide which one it will be! All those who attend are handed a small bag containing green plastic tokens. Each booth serves up a half cup of chili for your enjoyment. You may receive sour cream, cheese, or a sweet dessert along with it, depending upon the booth! Whether you go with super-spicy, or extra-mild, you'll get a real "kick" out of these homemade fixins' ! 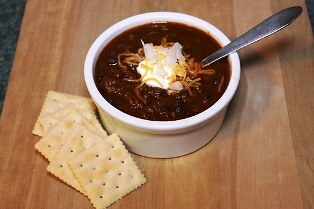 If you really want to get "fired up," get in line at the "All Sauced-Up stage for the Hot Chili Eating Contest! Every year hundreds of people line up to buy tickets for this "hot" night on the town! However, the real thrill begins around 5 o'clock in the evening when these tents begin to serve! I must say it's hard to place your vote because they are all tasty! Believe me, the competition is stiff! By the time you've visited all 25-30 booths, you might say you've had supper! By the end of the night, you're sure to have a "belly full!" 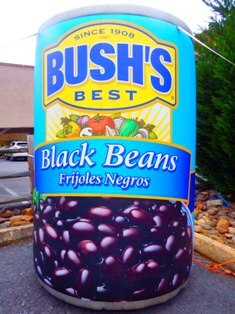 Gatlinburg's Chili Cook-off is presented by Bush Beans. 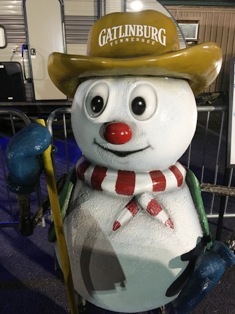 Gatlinburg Snowman gets "Chili Fix!" Vendors have a tendency to get a little wild as they come up with creative decorating ideas for their booths! It's exciting to just walk around and look at all the colorful canopies! There are prizes for the best booth! Choose your favorite and vote! Music is a universal language! Nothing says "Great Smoky Mountains" louder than Bluegrass! For 2018, John Whaley & Greenbriar performed an awesome live on-stage show! This talented group sang and played hits of their own, as well as famous tunes like "Rocky Top Tennessee." Because lead singer, Jim Whaley grew up in the Smoky Mountains area, he naturally has bluegrass roots. As a result, Whaley has written several songs including The Foundation, M.R. 's Rolling Store, and The Legend of Jack Huff. He also co-founded the Pine Mountain Railroad band in 1998. This chart-topping artist now brings the stage alive with high energy stage performances with his band, "Greenbriar." 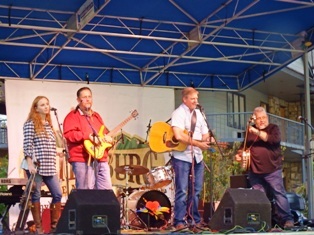 Another group that rocked the stage for the Gatlinburg Chili Cook-Off in 2018 was "The Petty Hearts" who tours the country doing a tribute to rocker Tom Petty who passed away in 2017 at the age of 66. The Tom Petty Hearts keep the music alive as they celebrate his life and musical legacy. They sing top hit songs performed by Tom Petty and the Heartbreakers as well as others that Petty himself rarely performed live. This group tours the country doing theater, and amphitheater performances as well as festivals honoring Tom Petty by recreating a live concert experiencing much like the original Tom Petty band. "Merry Christmas" from Santa Claus! 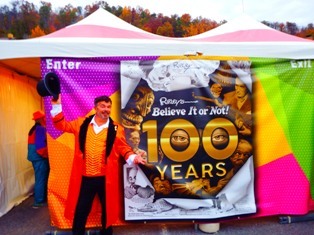 You never know who you might run into at the Gatlinburg Chili Cook-Off! 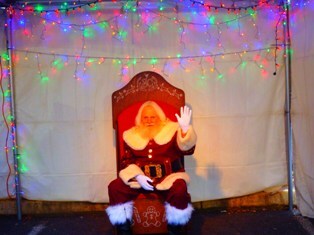 This Winter Magic festival may bring some famous faces, but the most popular of all is Santa Claus! The "man in red" had a big night at the Gatlinburg Chili Cook-off talking, and posing for photos with kids of every size and age. Sitting inside his lighted booth, he gave a jolly "Ho Ho Ho" to all the good little boys and girls who couldn't wait to tell him about their Christmas wish. Adults and teenagers joined in the fun by sitting on Santa Claus's lap for that traditional pose! 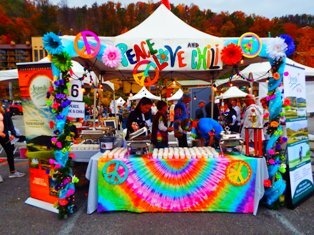 The Gatlinburg Chili Cook-off is presented by Bush Beans & Company. This festival is ta "kick-off" for the city's celebration of Winterfest! A ceremony by the city's officials signify the beginning of Gatlinburg's Winter Magic and includes the lighting of over three-million colorful lights across the city. 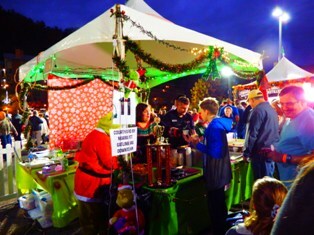 The annual cook-off happens the first week of November in downtown Gatlinburg. Festivities are in the evening from 5:00 P.M. til 8:00 P.M. The cost at the gate is $10. It includes chili sampling at all booths,voting coins, and live entertainment. "Winterfest" and "The Wonders of Magic" merchandise are sold on site. For more information, or to inquire about tickets for next year's event, please call the Gatlinburg Chamber of Commerce at 1-800-237=4569.